are the floor boards Murray pine? if so, what have they been stained with? We love our new kitchen. Thanks to the ideas from Houzz and designer Karen - what do you think? Grey counter - We're currently building and we're aiming for a similar idea with our kitchen...the stone too we have selected is the Marengo grey from smart stone. Do you think this will suit? We also have dark grey floor tiles. Hello, thank you for your question. Greys can be tricky, as like whites, they may have different undertones. They can be blue/grey, green/grey, red or warm grey, etc The Marengo is quite a warm, brown grey, and in fact it has become 'browner' in the new batch since we installed this kitchen. I would advise you compare a current batch sample of the Marengo to your grey tiles to make sure they match, you don't really want different undertones in the same room. Without seeing your tiles or what you are actually doing its hard to say if it will suit? Good luck with your renovation, regards, Karen. Hi, I need to correct myself. I am so sorry, but I mistakenly informed you that this counter was Marengo, however it is Naxos. Marengo is indeed more of a cool grey in comparison with Naxos. My apologies, however, advice re greys still stands! Dean We want to do something similar in our new kitchen but are strug - We want to do something similar in our new kitchen but are struggling with the design layout a bit. Do you have any plans for this kitchen with dimensions etc. would love to see if they would fit with what we have now. Hi, thanks for your question and request. Its difficult to use plans designed for another space based on a photo as many other factors may affect the dimensions such as ceiling heights, window and door placement, appliance sizes etc. If you haven't already done so, you may like to draw up your space to scale and plan the layout as above to see what you can fit into your space? The best solution would be to engage a professional to design the kitchen to suit your home. Best of luck, Karen. floor and vertical timber - can you please tell me what stain was used on the timber floor? what is the vertical timber please? Hi, thank you for your question. 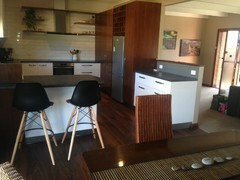 The cabinets are a spotted gum timber veneer and there is no stain on the floor. These are the existing cypress pine boards that has been sanded with a clear polyurethane finish. Please note that it is very difficult to judge nuances in neutral or earthy colours on computer screens, best to use actual samples of materials to judge the colour palette balance. Grey counter - Please could you tell me what the grey counter top is made from. Hi, it is a composite stone from Smartstone in colour Naxos. Stools - Where can I purchase these stools? Hi, these were purchased from Life Interiors. http://www.lifeinteriors.com.au/online-shop/bar-stools/taburet-wooden-bar-stool-walnut They appear to be on sale right now, good luck! Our new home - Would you be able to tell me what type of flooring this is? Timber used? This is the existing floor, I think it is Cypress Pine. The heart of the home, the kitchen, is a room in which both design and functionality are all-important. Karen Aston shows how the practicality can also look great. The timber adds warmth to this space and you really feel as though you could move around in this room. 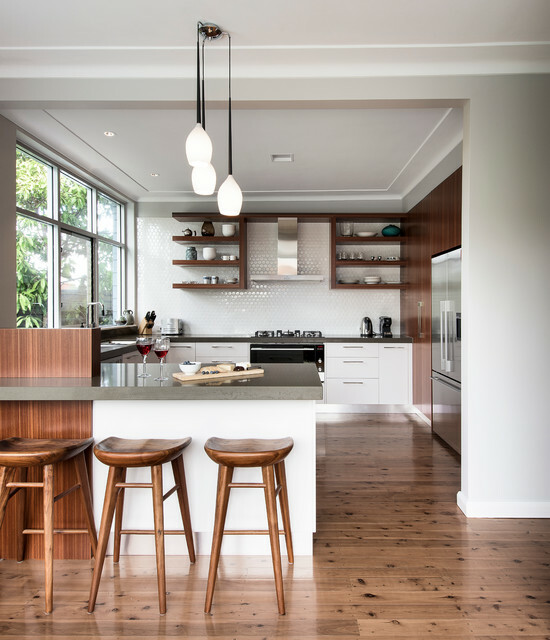 It was one of the most popular kitchen designs in Sydney and rightfully earned Aston a Houzz badge. 6. No upper cabinetsLosing the upper cabinets is a great solution for two types of kitchen owner – those with limited space and those who look for a decorated ‘living’ space in their kitchen, not just a practical ‘cooking’ space. Here, open shelving provides essential storage but allows the light, bright wall tiles to stay in the spotlight.Style tip: If you’re looking for a break from the rectangular subway tiles or small square mosaics that seem to show up in almost every kitchen, then it’s time to think geometrical. These honeycomb tiles have a subtle quality to them that add timeless interest. Solution: Go for warmthLook at the temperature of light bulbs, which is measured in kelvins and is marked on the packaging. Light globes of 2000-3000K will give you a warm white light, perfect for a cosy kitchen. Opt for low-glare styles. A good mix of indirect (or ambient) lighting paired with task lights for prep zones will set a practical yet welcoming tone in the kitchen. Having them on separate dimmable switches makes it easy to alter the mood when cooking or relaxing. Tip: Be wary of shiny benchtops that can reflect glare back at you when you’re prepping. 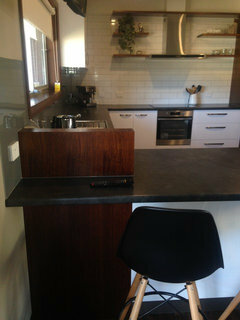 As I have to have a grey or black bench top I’m concerned about how dark it will be. This works though, although they do have a lot of light whereas we don’t.